Just finished my desktop publishing duties and got the January MapleBlues FTPd to the printer. Still trying to remember if I changed all the 2006s to 2007s. I turn on iTunes to hear my favourite blues radio show on CKLN.FM and it’s not connecting. After putzing around for a while, I get 88.1 on the radio (usually very bad, if any, reception where I live) As I listened a bit, I was hearing an unfamiliar voice and it took a while before I figured out it was Gary Kendall subbing for Dr Feelgood. I started searching on my newly merged database for the direct line to the studio. I can’t find the number under David Barnard or Julie Hill , the regular DJs, but I find it with a long-gone blues DJ, Steve Gash (long gone to Universal-land). Then I have to go to the other room because the battery on the cordless is dead…and I’m trying to hold that studio phone number in my head (I’m not good at that). I dial the number but when it doesn’t answer I’m thinking I got it wrong. I came back and listened on the radio for a bit then I heard Gary say on the air “Brian, call back” so we did get to chat and I made a call to the tech guy who checked and found that the server was down. CKLN is back online and now I will sit back and enjoy Steve Pritchard’s Bluegrass show. Always a great selection of music. He says twin fiddles are all the rage in bluegrass these days. Or you could do what Drew Jurecka does and wrap the bow on both sides of the strings ..or whatever it is he does to get those “triple stops” (3 strings sounding at once - I heard him demonstrating the technique on Stuart McLean). While listening to the bluegrass, I get an email from my friend Jacquie telling me to check out a link to iceberg.com where they have me listed (photo not available). It looks like they’re lnked to allmusic.com because it displays their review of my CD. It also say the release date was October 2005. Was it so long ago? 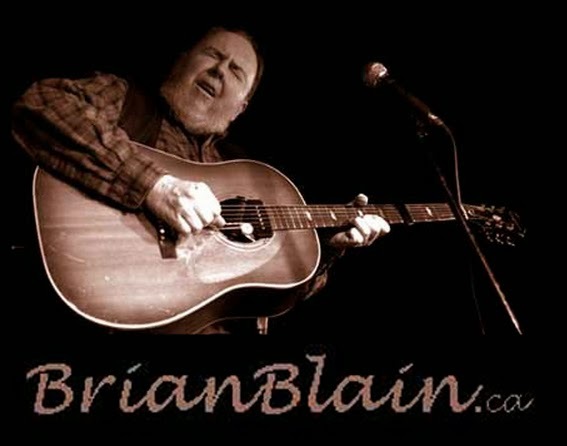 Well my record company man just asked me if I had written any new songs so I think that’s the trigger for a long process that will culminate in another Brian Blain album. I think I heard a click. Is that the sound of a gun being held to my head? (sometimes I work best that way). 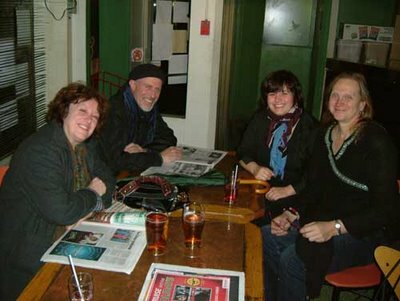 Jacquie Houston, Harry Manx, Roberta Hunt and Michelle Josef hanging out on the break. Last night I did my first gig at Grossman’s. Grossman’s, a blues “shrine” on the Canadian blues landscape. I remember it’s one of the only blues bars I knew about when I arrived in Toronto. The place where Downchild were discovered by Dan Aykroyd and where Jeff Healey made a buzz. I have to say I was a little taken aback when I made my first pilgrimage…could this be the place I had been hearing about all these years??? I seem to remember the washroom more than the band that was playing. It wasn’t no Downchild, anyway. I had previous been invited to sit in for a tune or two – I remember once with Gary Kendall and another time with Laura Hubert. But here I am – my first paying gig at Grossmans…and the pay wasn’t that bad. One CD sale topped it up to a reasonable wage. I guess I never asked for a gig at Grossman’s…but then they never asked me..not until Roberta Hunt sugeested we do something there (she plays there every Saturday with the Happy Pals). I got Michelle Josef to join us on drums and we had a ball. I must say the evening got off to miserable start when my beloved Epiphone took a fall and the headstock popped off. It’s in the shop now – I’m sure it can be fixed. The end result was that I used my Strat all night – I hadn’t even planned to bring it. And I had a great time with the Strat…though I’m the kind of guitar player who will play whatever you put in his lap, as long as it stays in tune. It wasn’t much of a turnout, I must say, though there was always at least 3 or 4 tables and more people hanging out on the periphery. I think one of them might have been a blues harp player I met in the summer. “Shrimp Daddy”, was that you? There was another illustrious visitor, Harry Manx dropped in on a (rare) day off on his tour with Michael Kaeshammer. I saw their show in Toronto a couple of weeks back - man, they are two phenomenal virtuosos. One great benefit to playing Grossman’s was finding out where the best place to have late-night Chinese food was (it’s the place with the Green sign across Spadina). And it was good. I have been putzing around with a new (improved?) system to send out e-blasts and it seems like it stalled on me. I'm now sending out the Blainletter 50 at a time. I merged my old address book with my fanlist and took the liberty of adding a few names to the fanlist – if this is your first Blainletter and you want it to be your last, just let me know. I assure you they don’t come out that often. On the Grossman’s poster I referred to myself as “The Real” Brian Blain, because following the theft of my wallet on a subway in Prague last month I’m starting to worry that there’s somebody out there who has more documentation to prove he’s Brian Blain than I do. (As if it wasn’t bad enough that there’s some pecan farmer in Oregon with my name). It’s time for me to be more assertive. For my remaining years, this Brian Blain is going to be IN YOUR FACE, lest anyone think they can steal THIS identity! Back from a rehearsal with Roberta I tune in Dr Feelgood on CKLN and what do you know…he’s playing a track from my album! It’s always interesting to hear how your stuff sounds on the radio, or in this case, on the computer. It does get scrunched up a little bit, but still sounded fine. Well, besides getting a spin on CKLN, what else has been happening in my music career, you ask (or not)... Last Saturday I was sitting with Shelagh Rogers backstage at Massey Hall and reminded her that I gave her a CD this time last year...I guess I was waiting for an engraved invitation to be on her show. Maybe this time I’ll do a little follow up. We were at the Toronto Blues Society’s Women’s Blues Revue where many of my musical colleagues were backing up a bevy of fine vocalists including the beloved Jackie Richardson and her powerhouse daughter Kim Richardson (who I had never seen perform, though I’m sure I’ve heard her backing vocals with many great artists). My long time collaborator Lily Sazz was the band leader and did a stellar job, as did Michelle, Suzie and Marg Stowe (who was in Prague at the same time as me and graciously invited me to open one of her shows). Don’t know when I will be making my way back to the States but when I do, I hope to do another house concert at Alice Brock’s studio in Provincetown. Alice has been my biggest booster down there (she’s being celebrated these days because it’s the 40th Anniversary of “Alice’s Restaurant). Visit her brand new website, www.alicebrock.com to see what she’s up to these days. Other shows I’ve seen since I got back from Europe: The Afro-Cuban All-Stars were at Massey Hall and though it started a little “sleepy” (for a Cuban band) it picked in the second half. The real highlight for me was looking across the aisle and seeing Billy Bryans, who has been going through some serious health challenges, looking fit as a fiddle and grooving to the music. A couple of nights later, it was the “Night To Remember,” Mory the Sockman’s big show at the Palais Royale with Downchild. I’ve never seen them playing better and Donny Walsh was really rockin’ on the guitar as were Michael Fonfara and a the rock solid rhythm section of Gary Kendall and Mike Fitzpatrick (who, regretfully, is leaving the band). Luckily, they recorded the night for a CD/DVD release so many more will share the excitement of that evening. Downtown Jazz brought in Roy Ayers and the “Superstars of Jazz Fusion” and this was one show that both me and my son Joel could both get into, but I think Joel preferred Roy when he was playing in town last year with Nick “Brownman” Ali and some DJ/remixers who may not have been superstars but who certainly knew how to raise the roof. Then I saw Britain’s favourite R&B sensation, James Hunter, and even though James himself was in better shape than the last time I saw him - he was at the Supermaket last summer but apparently had a bad cold - so this time he was hitting a lot more of his trademark Jackie Wilson high notes, but there was something different about the band. Maybe the personnel had changed. Anyway, I love that tenor & baritone sax section. The Aboriginal Music Awards was, as always, a great uplifting evening. My friend Raven Kanatakta was doing a lot of the conducting and tore off a few blistering solos. We’ll be playing together in Barrie next month and I’m looking forward to it. I had a visit from my old buddy Harry Manx and saw his show with Michael Kaeshammer at Harbourfront. They had been touring this show for a month when I saw them and had another 20 dates to go. Harry had just bought another guitar (he carries five or six already!) and we jammed a bit. It was a solid-body lap slide, beautifully made. Can’t remember the name of the luthier, but Harry tells me there’s quite a long waiting list for one of these instruments. Harry was happy to hang out in my neighborhood again (I live in “Little India”) and dropped a bundle on Indian CDs at my neighborhood music store. Well, that’s probably enough for now. I was going to talk a bit about my European adventure but you can read more on my blog at http://torontobluesdiary.blogspot.com.